Understanding how cells divide is a major goal in cancer research. A new £1.2million project by Warwick Medical School’s Stephen Royle aims to understand cell biology phenomena at a molecular scale, which could lead to the development of possible new cancer therapies. Halting tumour cell division in cancer is a valid therapeutic route, and so finding pioneering ways to target cell division – whilst minimising patient side effects – involves a full understanding of the cell division machinery. Errors in cell division cause aneuploidy, a form of genomic instability thought to drive tumour formation and propagation. Therefore, understanding the causes of chromosome missegregation during cell division is important to prevent cancer initiation. The research programme will focus on proteins that stabilise the microtubules of the mitotic spindle, the apparatus facilitating the chromosome segregation during cell division. Breaking apart the protein complexes has the potential to halt cell division in cancer with fewer side effects. The majority of the work will be focused on cell imaging data from light and electron microscopy. 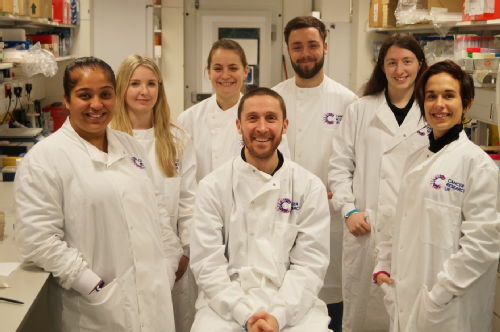 Entitled ‘Mitotic Spindle Stability and Chromosome Missegregation in Cancer’, the project is funded by Cancer Research UK and will run for a total of five years. Pictured above: Stephen Royle (centre) and his team.